December 14, 2018, 6:00 p.m.
Who doesn’t like Christmas music? 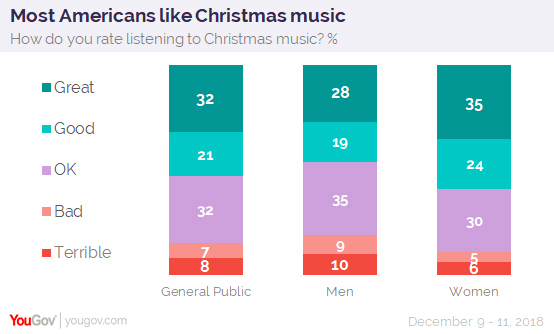 Just 15% of Americans believe listening to Christmas music is bad or terrible. And in the latest Economist/YouGov Poll, it’s the men who are more grumpy: 19% of them say it’s bad or terrible, compared with just 11% of women. The latest winter song to prove problematic for some is Baby, It’s Cold Outside, the Frank Loesser song used in the 1949 movie Neptune’s Daughter, starring Esther Williams and Ricardo Montalban. The sheet music’s lyrics are written for the Wolf and the Mouse, and sung by Montalban and Williams in those roles. But then the roles are reversed in a parallel scene: Betty Garrett becomes an even more assertive wolf and Red Skelton the mouse. You can find both versions here. Some radio stations have banned playing the song. But then several reversed themselves. 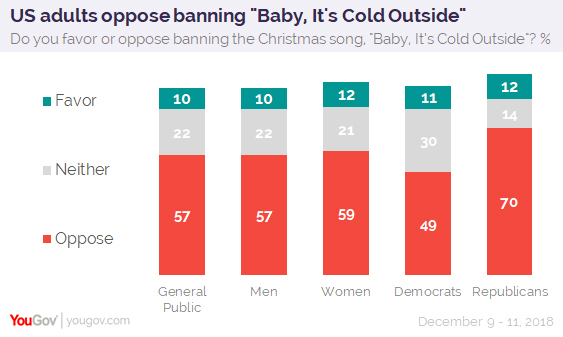 What those stations who restored the song heard from their listeners reflected the opinions of most Americans polled over the weekend: by more than five to one, the public opposes banning Baby, It’s Cold Outside. Men and women agree, and so do Republicans and Democrats. Those who know the words to Baby It’s Cold Outside oppose banning it six to one. Liberals, conservatives, Trump voters, and Clinton voters oppose a ban. Americans reject an argument for the ban made by a host on the Cleveland station that first imposed the ban (and that of this writing still bans the song): that it is wrong and manipulative in the #MeToo era. Just 14% accept that argument. 52% disagree with it. 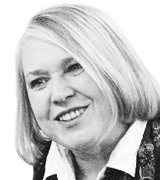 Baby, It’s Cold Outside clearly is seen by Americans as a fine Christmas song. But there is a limit to tolerance when it comes to Christmas music. That limit isn’t about what is played, but when it is played. 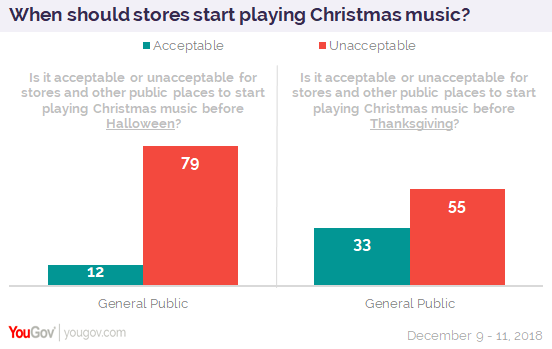 Most Americans find it unacceptable for stores and public places to start playing Christmas music before Thanksgiving, and even more say that about Christmas music before Halloween. See full toplines and tables results.